This is one of the perfume I have been wanting for so long. This is the Juicy Couture Couture La La. I got this through MySale, use some vouchers I have and I only pay this perfume for RM60+. It is one of the best spend money ever! They always have perfume sale and don't ask me more about this. As far as I trust that they are all authentic. So back to the topic, obviously I am going to talk about why I buy this. 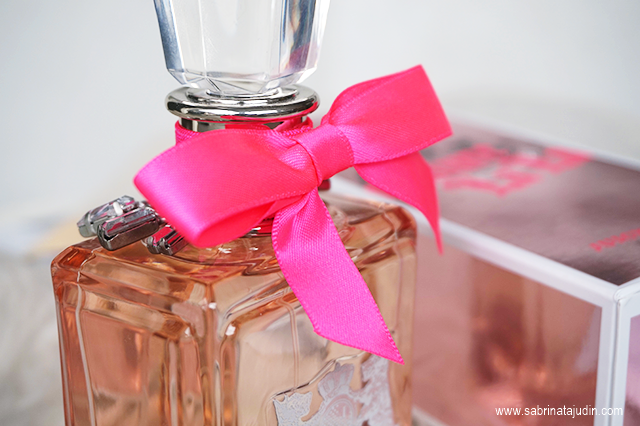 Of course, the packaging are just... can we just take a moment to appreciate the gorgeous rose gold box and the hot pink ribbon on the bottle. Sho cute! I got the one in 100ml. I think it is the biggest one and yes the bottle is pretty heavy. Not travel friendly. 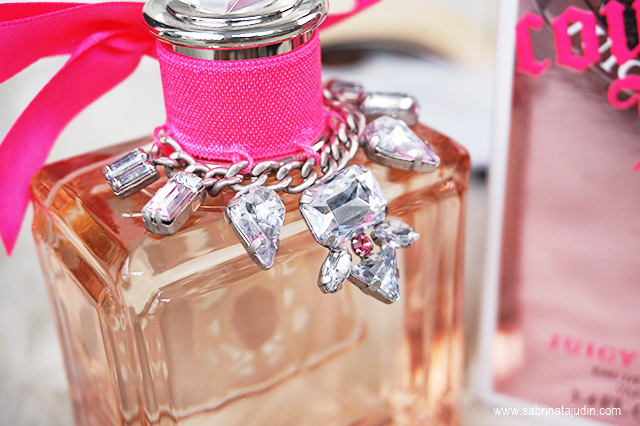 It has this diamond shape cap and these beautiful clear rhinestones charms on the neck of the bottle. Top it of with a very striking hot pink ribbon tied perfectly on it. It also have a embossed silver Juicy Couture signature cute puppies on the front. The bottle is transparent clear and the perfume itself are actually coloured. So that is all for the look of the perfume. Pretty mouthful. Now I am going to talk about the scent. Another reason why I got this is that this is the scent that is basically "fresh". 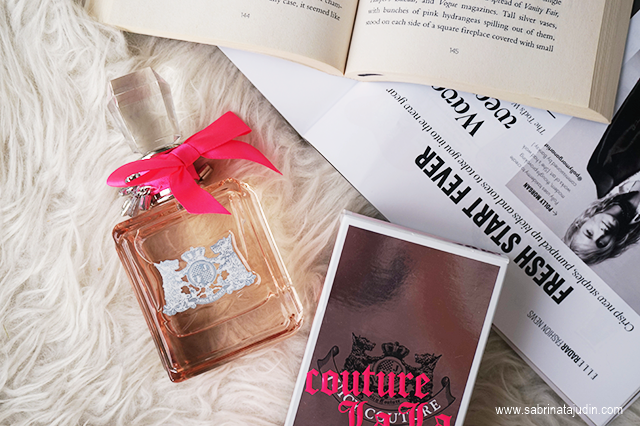 The first debut Juicy Couture perfume smells more "luxury" I could say. This one are just my type of scent. This version are describe as a free spirited and effortlessly glamorous women. It has a luscious Floral - Fruity bouquet scent with a bit of a fresh musky noted. The top notes are mandarin, green apple and red current. The middle noted are White flowers of lily of the valley, orange blossom with a mix of powdery violet leaves. The base are sensual musk accords. The face of this perfume is said to be Karlie Kloss. They are available in Sephora if you are interested in touching and smelling them by your self and they retails about RM340+ if I am not mistaken. 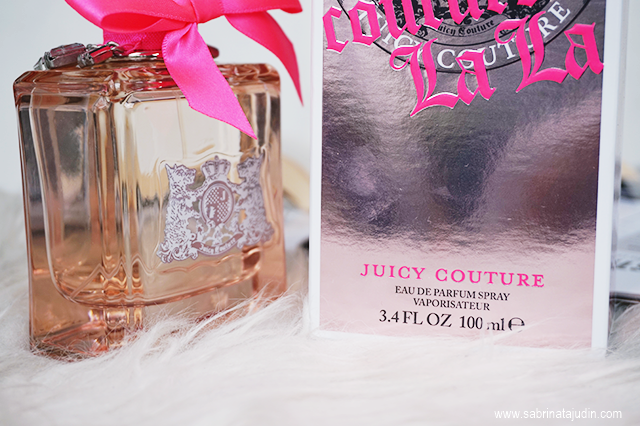 I might dive in to more Juicy Couture others perfume range because i think they are one of the designer perfume that I love especially on the look of the bottle it self. Pretty sum up a Sabrina, the sucker for packaging.